When the North American Free Trade Agreement was drafted in the early ’90s, most Canadian households did not have internet. Consumers drove to their local mall to purchase an item and financial interactions involved a teller, not a machine. Today Canadians can flip open a tablet and order a pair of shoes from Italy, a frying pan from Japan, or the latest toy from China and it will be delivered to their door, sometimes even by drone. Clearly, the way we do business has evolved since the signing of NAFTA in 1994. As companies in Canada, the U.S. and Mexico wait with trepidation for NAFTA renegotiations later this year, the Canadian Chamber of Commerce sees opportunity amid the peril — a chance to modernize elements of this venerable but crucial agreement. NAFTA’s inception more than 20 years ago eliminated most barriers to free trade and investment among the three countries. Businesses have benefited from greater access to materials, technologies and talent. The result has been better economic growth, impressive job creation, as well as lower prices and a greater selection of consumer goods. 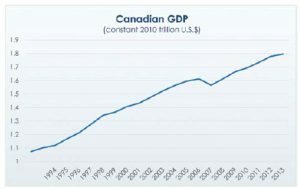 Since 1994, Canada’s trade with the U.S. has risen by 254 per cent to $670 billion. Canadians are not the only ones at risk of losing out on NAFTA’s benefits — about 14 million American jobs depend on trade with Mexico and Canada, according to the U.S. Chamber of Commerce. Although the advantages of NAFTA as it stands are clear, there are several areas within the agreement that could be reworked for the benefit of all countries involved. In light of technological advances over the past 23 years, NAFTA lacks any reference to the rapidly growing online marketplace. A new agreement would need to address the new realities of e-commerce, digital trade and its associated services. The same is true of purely electronic services, such as app and website design. The new NAFTA must also allow the Canadian entrepreneur who created an innovative new app to have access to the U.S. and Mexican markets in the same fashion the furniture or hardware manufacturers do. Of course, addressing the ever-changing realities in digital commerce also involves the inclusion of taxation measures, intellectual property protection and data-transfer rules. Legislators in the U.S. are already raising data rules and cloud computing issues such as privacy. There is an opening for Canada and the U.S. to align on this issue. The manufacturing of goods has also evolved since NAFTA was signed. With increasingly complex manufactured goods and parts, companies are now working under outdated rules of origin laid out in the initial agreement. This affects how goods are classified, but also how regional content is calculated, influencing everything from purchasing to assembly decisions and overall manufacturing productivity. Modernizing NAFTA’s rules of origin would offer greater certainty to North American manufacturers and exporters. Businesses from all countries would also benefit from revising outdated elements of NAFTA concerning the mobility of workers, specifically recognizing occupational designations that have sprung up in the last two decades. Canada has long advocated expanding the NAFTA visa-exempt categories for temporary entry. Currently, ambiguous job lists pose challenges for businesses trying to allow entry of professionals whose occupations did not exist at the time that NAFTA was negotiated, like specialized video game designers, professional drone pilots or specific programmers. We have already seen disagreements arise in sectors ranging from health care to allied professions. There is now the opportunity to develop an effective mechanism that keeps job profiles updated and reflective of the real economy. Technological advances, rules of origin and worker mobility are just a few areas that the Canadian Chamber of Commerce suggests the countries include in NAFTA talks. The chamber has laid out an in-depth proposal for a new agreement with recommendations that focus only on trade. While NAFTA is at its core an economic agreement, it also goes much further than trade measures and tax issues. Modern trade agreements, such as the ones that will be built on the foundation of the Comprehensive Economic Trade Agreement (CETA) between Canada and the European Union, will extend well into cultural, environmental and social issues. The current situation provides an excellent opportunity to update NAFTA to include provisions similar to CETA. While it would be wise to avoid issues of security policy, which will make negotiations more complex and difficult, measures introduced as a result of climate policies, for instance, could be included in order to set a baseline for environmental protection. Nearly every province, territory and state has a different set of environmental rules. California recently tabled legislation that would create a new cap-and-trade system in the state, effective in 2020. The proposal would include a border tax, essentially a carbon tax, on imports. In the NAFTA negotiation, countries might seek exemption from this and similar measures introduced by state or national governments, pursuant to some calculation of the incremental costs represented by specific carbon-reduction policy. The chamber’s vision is of a more inclusive NAFTA, which would take into account the reality of small business and rural communities. Our goal is an agreement that will help money flow to all Canadian businesses and regions, from the logistics multinational in Toronto to the small machine shop in Moose Jaw. So the key question is, how do we get to such an agreement? During a visit this June to Washington, D.C., the Canadian Chamber joined an agreement with the U.S. Chamber and the Mexican business organization, Consejo Coordinador Empresarial (CCE). By signing the North American Economic Agreement, the three organizations pledged to collaborate in ensuring that any changes to NAFTA benefit all three countries and that the negotiations, difficult as they may be, first serve to “do no harm” by protecting the millions of jobs and revenues that NAFTA supports in all three countries. Further, they insisted that it lead to even more growth and competitiveness across the hemisphere. The Canadian Chamber is also laying out the groundwork for productive discussions with our American partners beyond the Washington bubble. Trade missions designed to raise awareness of the importance of trade with Canada are being planned out, with the stated purpose of meeting governors, senators and congressional representatives in South Carolina, Virginia and Tennessee. Reshaping an agreement this influential to the economic success of our regions cannot be rushed. We know it will take time. Any critical trade negotiation will. The Canada-European Union Comprehensive Economic and Trade Agreement started in 2006 and didn’t conclude until 2014. Trans-Pacific Partnership negotiations began in 2008 and only finalized in 2016. In each business community on every side of the border, there is no question the mood is uneasy. As the voice of Canadian business, the chamber is acutely aware of the dangers inherent in reopening such a vital pact between our trading partners. But in this new economic and political reality, we cannot ignore the opportunity to modernize elements of the agreement. 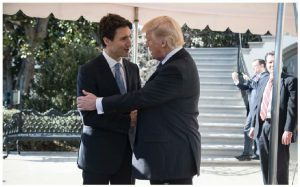 Canada, the U.S. and Mexico are linked in every conceivable way and their future prosperity will be enhanced if a new NAFTA is crafted to each country’s advantage.